Geomedia offers critical analysis of the new possibilities and power relations emerging in the public space of contemporary cities. As ubiquitous digital networks enable embedded and mobile devices to integrate place-specific data with real-time feedback circuits, everyday experience of public space has become subject to new demands. Looking beyond debates framed by the dominance of surveillance and spectacle, McQuire asks: how might the kind of collaborative practices that have flourished in art and online cultures be translated into urban space? In the urban crisis of the 1960s, Henri Lefebvre argued that the capacity for a city’s inhabitants to actively appropriate the time and space of their surroundings was a critical dimension of modern democracy. What does it mean to speak of ‘the right to the city’ in the context of the networked city? Addressing this question through a series of case studies, this cutting-edge text highlights the tensions between citizen and consumer, communication and surveillance, participation and control, which define contemporary struggles over public space. "This book is a reflexive navigation of the changing meanings and uses of public space at times of intense mediation. Through the concept of geomedia, McQuire skilfully brings the media back to the city and to the public space where sociality and politics are negotiated and contested." "Scott McGuires scholarly tour takes the reader from mimesis to urban screens, from the magic of the street to global interpersonal civics. His creative insights are rooted in an impressively diversified body of work from communication, urban, and architectural theorists. 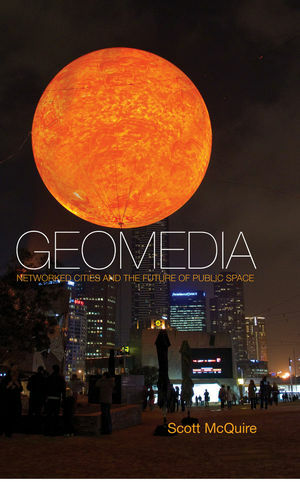 GeoMedia is an absolute primer in urban communication."